The Kinta FX by Chauvet is a stunning Moonflower style, multi-effect that incorporates a Kinta, Laser and SMD Strobe effect all in one. 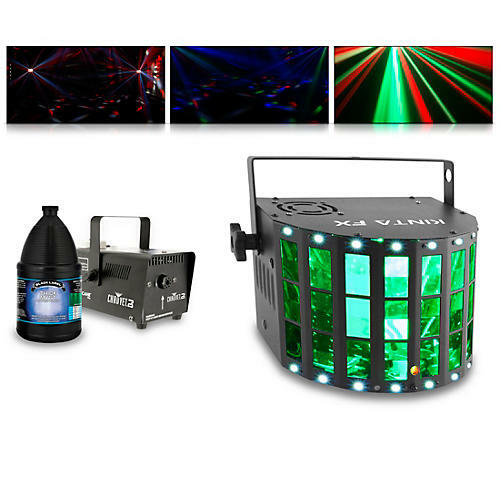 It can easily project countless multicolor beams, and features SMD strobes that produce eye-catching effects and chases, as well as a red and green laser that casts hundreds razor-sharp beams across any dance floor or venue. Master/Slave with other units to create an custom, coordinated light show that will dazzle any crowd. Easily control the unit from DMX, Master/Slave, IRC- 6 or the digital display, and save time running cables and extension cords by power linking multiple units together.